Emojis add a smile to everyone's face. 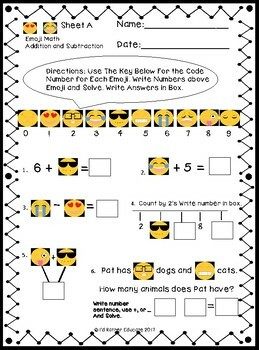 This Set of Emoji Addition and Subtraction activities, will entertain while reinforcing basic addition and subtraction computation. Each Activity also includes a Number Story for Real-World connections. 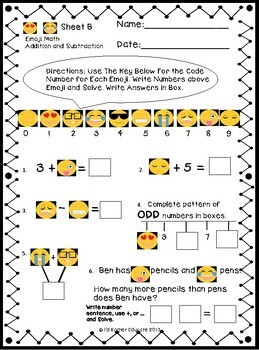 Students use a key listed on each page to determine the code number for each Emoji. Students rewrite the numbers and solve the equations. 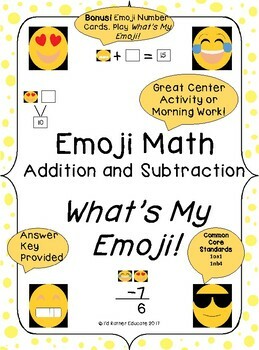 Five "What's My Emoji" Activity Sheets. Sheets cover One digit , Two digit, And Three digit Addition and Subtraction. "What's My Emoji" game includes 9 Emoji Cards and 10 number Cards. Game Instructions are Included. Laminate Cards for long lasting durability. Game can be played during Math Centers or for Morning Work with classmates. 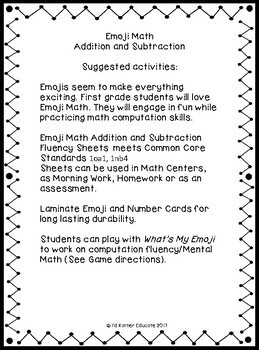 Can be used for 2nd and 3rd Grade Remediation.